Designer Lee Broom launched his Salon Collection at the London Design Festival, which just ended about a week ago. 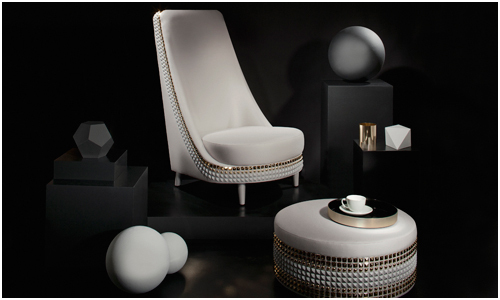 Inspired by the curvaceous lines of 1930s upholstery and with accentuated modern stud detailing, this collection brings the best of the classic – with some bling. Speaking of bling, Lee Broom has chosen to exaggerate the hand finished and hand applied studding to create that modern look. This is in contrast to using studding to hide aspects of the manufacturing process. By working with quality British craftsman, Lee Broom strives to ensure the quality of each of his creations. 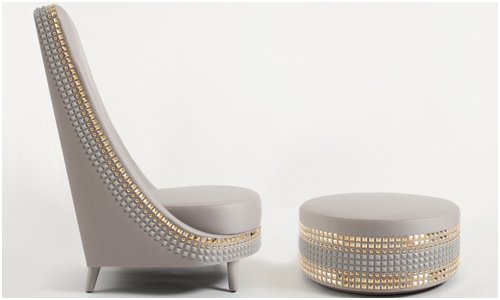 The Salon collection includes six pieces – an armchair, dining chair, sofa, footstool, drum seat and cushions. Different color choices are available – choose from beiges, greys, blacks and whites. If you want to have more fun, try wool, velvet and leather finishes. Very funky. Classic lines but the bling gives it an edge. Definitely should follow his career! I like his designs, concepts and his thought process.